As the title suggests, this version of Chelsea Green's original 1999 version expands the scope to include commercial-scale wind turbines used in distributed applications. As such, this book includes wind turbines of all sizes. This edition makes a distinction between large numbers of commercial-scale wind turbines used in central-station power plants, or wind farms, and wind turbines used singly or in small clusters both on and off the grid. In 1999, Wind Energy Basics introduced micro and mini wind turbines and explained how to install and use them. This version introduces the concept of "community wind" where groups of people invest in large wind turbines that produce commercial quantities of electricity for sale to the grid. While a seemingly novel concept in North America, it is quite common in Denmark, and Germany, and increasingly so in France. In community wind, farmers, small businesses, and groups of community-minded citizens band together to develop-for profit--"their" wind resources. It's as if they're saying, "Renewable energy is far too important to be left to the electric utilities alone. We have a responsibility for our own future. We can and will develop our own wind resources for our own benefit and for the benefit of our communities." By proving that it can be done, Germans and Danes have served as models for us in North America. This version of Wind Energy Basics has been extensively updated to include topics that are of increasing interest to North American consumers and wind energy advocates alike. Urban wind. Does it make sense? Building integrated wind. Is it real or not? Rooftop mounting. Should you avoid it? New vertical axis wind turbines. Are they ready? Fantasy wind turbines. How to spot them. Ducted turbines. Can they deliver? Community wind-a not so new way to harness the wind. Feed-in Tariffs. Can they power a renewables revolution? The most significant change is the addition of a new chapter on community wind, and why this can be an exciting option for many who might otherwise struggle to put a small wind turbine in their back yards-or worse, on their roofs. Another departure from the earlier version is a concluding chapter on a policy option that can make all this possible: Advanced Renewable Tariffs and the feed-in tariffs that make them work. Wind energy--especially small wind turbines--have been plagued with hustlers and fast talkers "selling wind on hope and hype," as one wag put it. The situation has only gotten worse as the use of the Internet has grown. It's never been easier to pawn "fantasy wind turbines"--or as Mick Sagrillo, the wind sage of Wisconsin, likes to call them, "Internet wonders"--on an unsuspecting public. 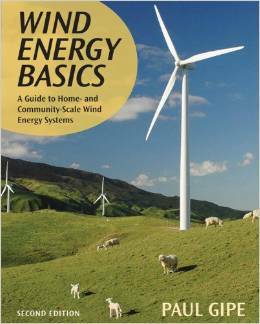 As in the previous version, this edition of Wind Energy Basics frankly tells you what works, what doesn't, and what to avoid. “Gipe’s call for an ethical energy policy in Wind Energy Basics is a message that North American politicians should heed. The people deserve nothing less.”--Glen Estill, Past President of the Canadian Wind Energy Association, and successful wind entrepreneur. Paul Gipe, the country's leading expert on small scale and locally-owned wind energy, has written the how-to manual for those who want to literally bring power to the people.--David Morris, Vice President, Institute for Local Self Reliance, and author of Seeing the Light: Regaining Control of Our Electricity System. Chelsea Green Publishing, White River Junction, Vermont, available beginning April 2009, $29.95 USD, Paperback 8 x 10 inches, 224 pages, Color illustrations, charts, and tables, ISBN 978-1-60358-030-4, www.chelseagrean.com.